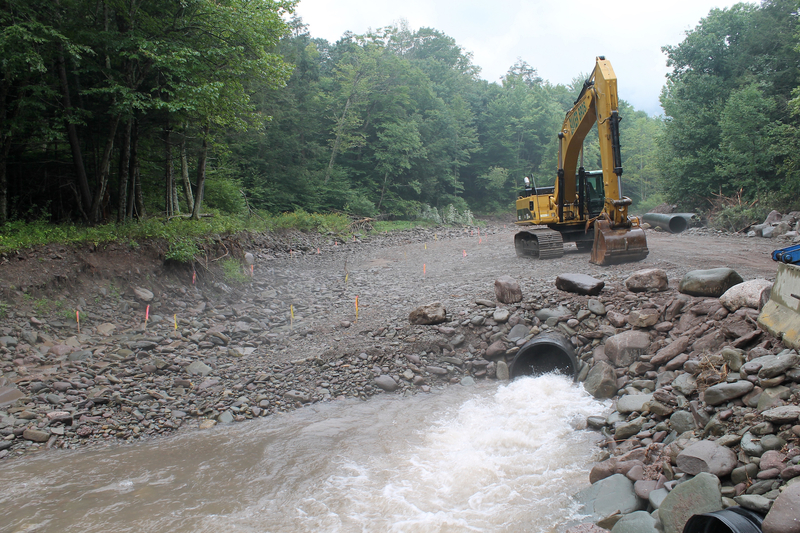 The Wood­land Creek stream restora­tion project is under­way! 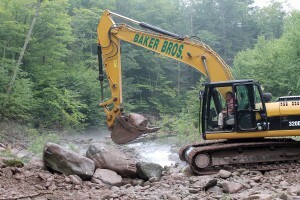 A sec­tion of Wood­land Creek just upstream of the Wilmot Way bridge is being restored to sta­ble con­di­tions to pre­vent fur­ther bank ero­sion and down­cut­ting of the stream chan­nel. 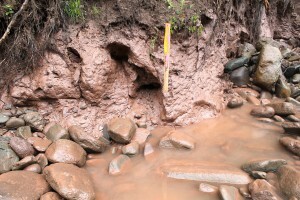 Ero­sion has exposed heavy clay deposits that turn the stream a muddy brown after it rains. 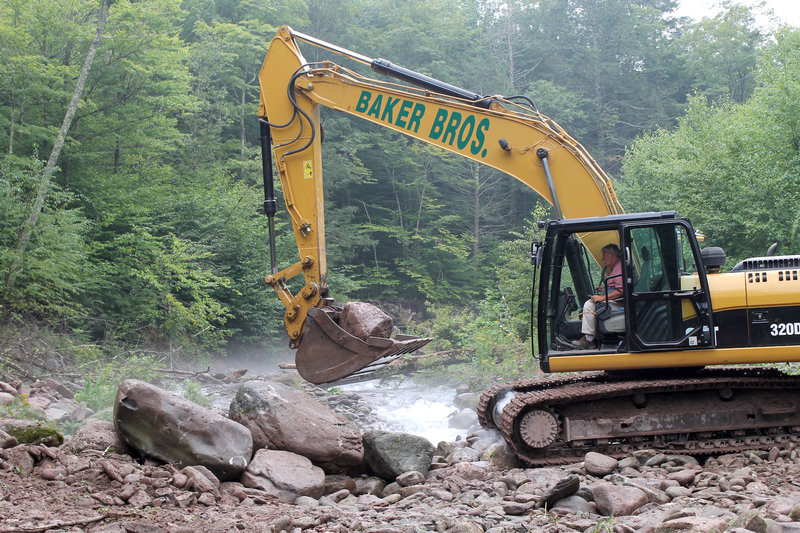 Con­struc­tion con­trac­tor Kingston Equip­ment Rental/Baker Broth­ers Exca­vat­ing and the Ulster County Soil & Water Con­ser­va­tion Dis­trict work­ing with project engi­neer Milone & MacB­room are imple­ment­ing the project. See pho­tos of the ini­tial phases of con­struc­tion below. 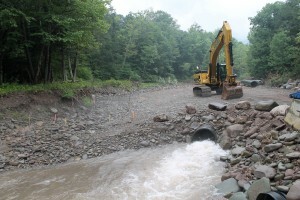 Water is piped around and beneath the project area to help pre­vent sed­i­ment from wash­ing down­stream dur­ing construction. 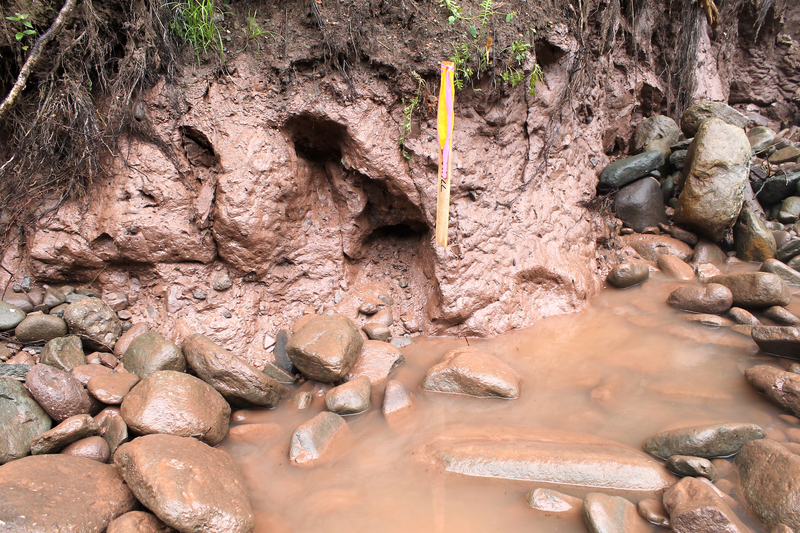 Clay deposited as glac­i­ers retreated over 10,000 years ago is exposed in a stream bank at the project site. An equip­ment oper­a­tor with Baker Broth­ers Exca­vat­ing moves a boul­der dur­ing chan­nel reconstruction. The project began on sched­ule, but recent fre­quent rain may delay project com­ple­tion until early Octo­ber, or next spring with the project shut down over win­ter. For more infor­ma­tion, con­tact the AWSMP office at (845) 688‑3047.